1. Preheat the oven to 190°C, gas mark 5. Trim the leeks (there’s no need to remove all the green parts), and cut into chunky pieces. Scatter in a shallow ovenproof dish, pour the cream on top and sprinkle with 4 tbsps of water. Season with plenty of nutmeg and a little salt and pepper. Cover tightly with foil and bake for 30 minutes. 2. Heat a dry frying pan and fry the bacon for 4-5 minutes until golden. Put the flour in a bowl and add the butter, cut into small pieces. Rub in with the fingertips until the mixture resembles coarse crumbs. Add to the bacon with the oats and rosemary and stir to mix. 3. 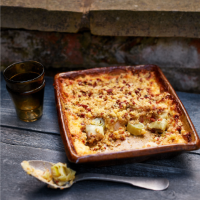 Scatter the crumble over the leeks and return to the oven, uncovered, for a further 20–25 minutes until pale golden.